Domaine Leflaive, alongside Coche Dury sits at the summit of white Burgundy and evokes similar fanaticism to the likes of DRC, Rousseau & Leroy. The Domaine’s holdings in Puligny are second to none, and the much like the other leading lady in Burgundy, Lalou-Bize Leroy, the Village wines are of 1er Cru quality, the 1er Crus at Grand Cru level, and if you are fortunate enough the Grand Crus are in a completely different league for white Burgundy. Clive Coates summed it up very well; ‘‘the top Montrachets, Chevaliers and Bartards are wines to drink on bended knees, with heartfelt and humble thanks’. One of the most iconic wine producers in Burgundy. The Leflaives have been extant in Puligny since 1717. Anne-Claude Leflaive (1956-2015), alongside Lalou Bize-Leroy most respected wine-maker in Burgundy and pioneer of biodynamic viticulture. Proven strong long term potential, highly collectable. Liv-ex Burgundy 150 index* has produced the strongest return over a 10-year period: 11.6%. Liv-ex Burgundy 150 index increased by 235.61% since 2004. 9th in the Liv Ex Power 100 based purely on price performance. Tiny production with demand way outstripping supply. 0.0821 hectares of Le Montrachet, the greatest white wine in the world. 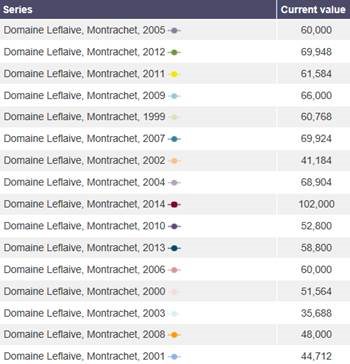 Average bottle price of Leflaive Montrachet since 2000, £4.7K. Allen Meadows of Burghound is a notoriously conservative scorer – 96 would represent a much higher score with all other leading critics. Allen Meadows 95 – 100 points “Truly incomparable and emotionally thrilling. A wine so rated is as good as Burgundy gets. By definition, it is a reference standard for its appellation. *The Burgundy 150 index tracks the price movements of the 10 most recent physical vintages for 15 red and white Burgundy wines of which Leflaive’s Batard Montrachet is one them in 2015. 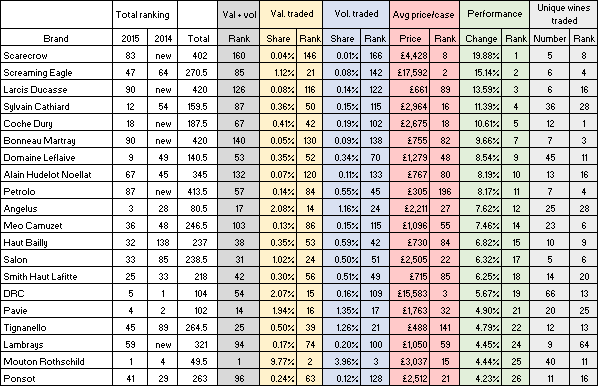 Burgundy has been in the spotlight for its rising prices: the region dominated the top price movers within the Power 100 last year, and the Burgundy 150 Index reached a new high in 2016. 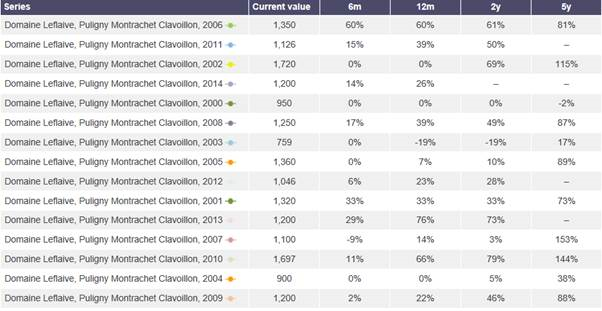 Domaine Leflaive has also climbed to 9th place (previously at 49) overall in the Liv-Ex’s Power 100 based purely on the strongest price performers – a Domaine at the top of its game with huge momentum. The graph below charts Leflaive’s Le Montrachet grand cru performance over a 24 month period, since 2000. • Average performance of modern vintages (2000-2014) over the last 24 months - 28.42% increase. Arguably the greatest growth over the past few years has been across the premier cru and village level. With grand cru wines commanding formidable prices (2014 Domaine Leflaive Le Montrachet £102,000.00/12) there has been a shift in focus to premier cru where there is perceived value. With modern day wine making techniques as good as they are, many premier crus are produced at a level close to grand cru. If there was a reclassification of Burgundy AOC today, some premier crus, from a handful of top producers would be granted grand cru status. Across the four main premier cru sites in Puligny Montrachet, over the previous 14 vintages we see an average performance of 22.75% (12 months), 31.84% (24 months) & 65.97% (five years). Allocations will be extremely tight, so please indicate interest ASAP.